Many of you know that I am a huge Star Wars fan. 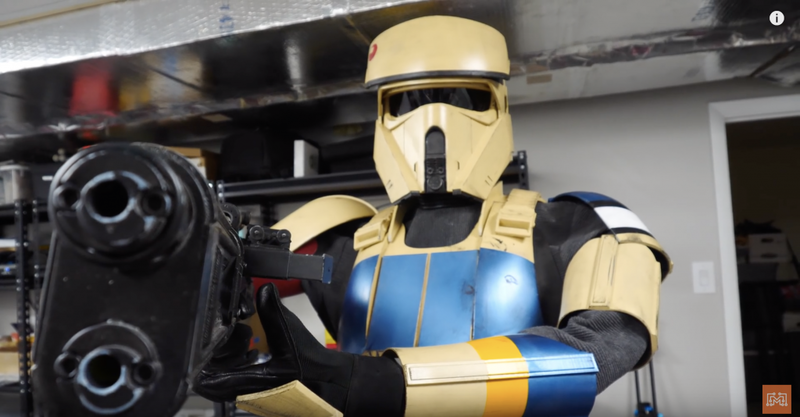 But you may not know that for the past 2 years, I’ve been building a fully-3d printed set of Shore Trooper armor. 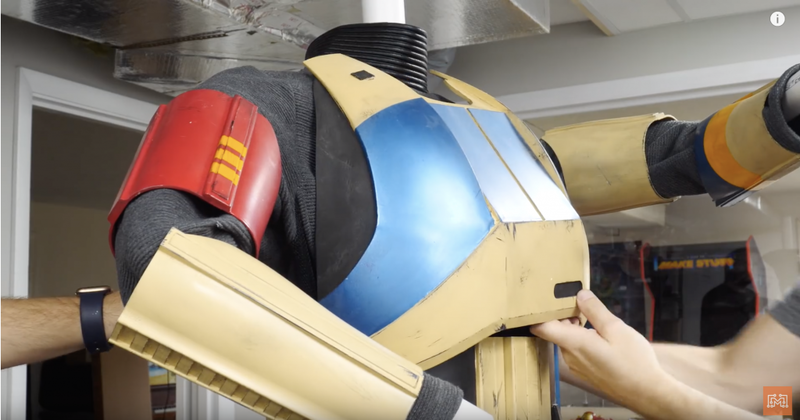 I’m almost finished with the costume, but it is time to build a posable mannequin so he can become a life-size action figure! This entire set of 3d printed armor has been built and assembled almost exclusively on my live build stream on Twitch. It has taken me quite a while to get this far and I’m really happy that it’s almost finished. The audience that participates on the live stream decided to name this Shore Trooper “Dan,” after a label on the box the parts were kept in. Because this armor set was scaled to fit my body, I had to measure my extremities to get an accurate mannequin. Josh marked out my arms, legs, collar bone, and torso lengths with tape while I laid on the floor. We used these measurements as the basis for the PVC pipe segments that would make up the skeleton. Because I want Dan to be able to stand in different poses I needed to factor in some moveable joints. Like a good trooper he is, Dan will always be carrying his rifle in this right hand. That arm should articulate a little, but it needs to be more rigid and strong. The left hand should be more flexible and posable so he can hold the rifle, point at rebel scum, or wave to his fictitious brother Gil. The knees should also bend slightly depending on certain action poses. 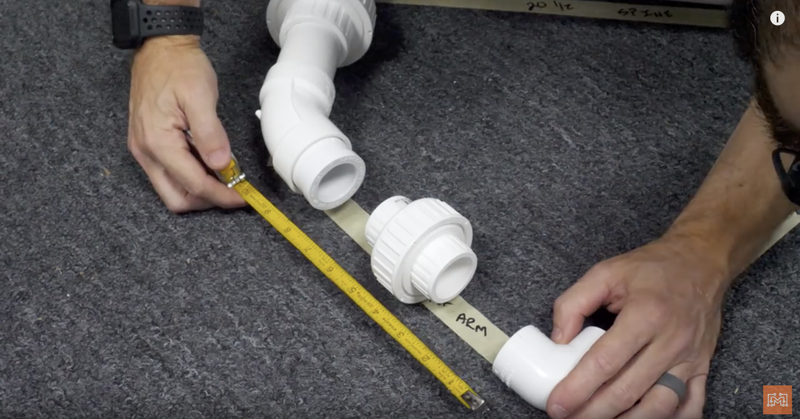 With these joints in mind, we found some simple PVC solutions at Lowe’s. 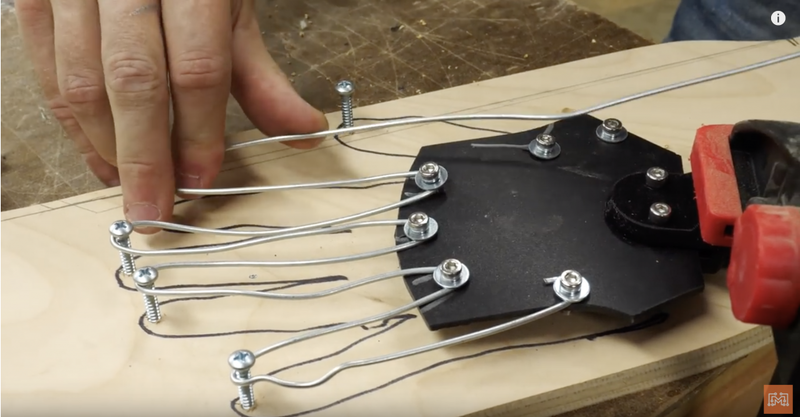 By using threaded unions that can be tightened into different positions, we can give a full range of arm motions when placed in the right location. Placing the unions on the outer collar bone allows the arm to move forward and back, and by adding one to the bicep, the elbows and forearms can rotate. The wrists will be made separately so they can rotate freely. The knees simply need to move forward and backward. Because this skeleton is made of PVC, I can decide which pieces need to be glued in place and which ones should be held with friction. The non-glued joints allow for some level of articulation in places like the hips, the thighs, and the feet. Using the taped-off measurements we made earlier, I began cutting the PVC “bones.” I used thicker PVC as a spine to support the rest of the mannequin, a 4-way unions to attach the collar bones and the neck, and a T-union to attach the hips. Using a combination of 45- & 90-degree unions, we made the rigid right arm and also portions of the shoulders and hips. Josh modeled and 3d printed some simple posable joints. We used these parts as unions between the PVC pipe that tightened into placed using a 1/4-20 bolts and wing nut. These parts made up the left elbow and the two knees. I had an old piece of cherry butcher block that will act as the base. 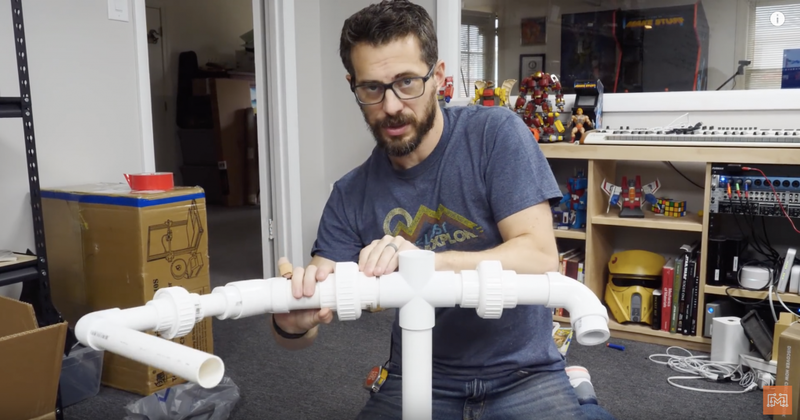 While the PVC pipe skeleton is versatile and posable, it isn’t strong enough to stand on its own. 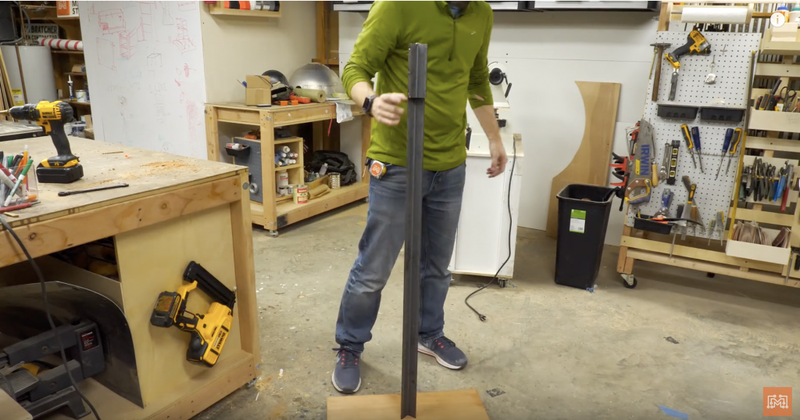 To hold it upright, I needed to make a support beam that attaches to the base and holds Dan up. I chose to use some 1 1/4″ angle iron I had left over. I cut a slot in the butcher block base and mounted the beam from underneath using a small plate. To mount the skeleton to the beam, I needed to add an offset spacer. I used small cutoff pieces of the angle iron welded together to give Dan a stand-off gap. This gap is necessary because I couldn’t pull his pants up if the beam were mounted straight to the spine. Dan was fixed to the beam using pipe clamps so he could be adjusted up or down. I took a lot of inspiration from Bill & Brit Doran at Punished Props Academy. They recently build a mannequin display with hands made out of armature wire. 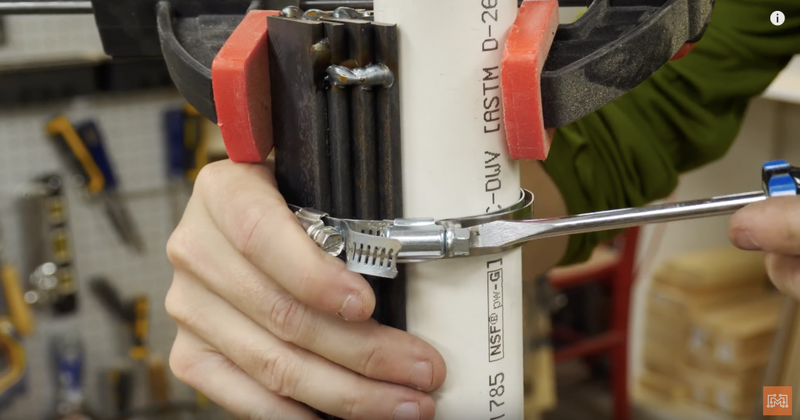 Mine was made in the same fashion, but Josh printed up another connector with some bolts and nuts to mount the hand to the PVC pipe. I cut out a “palm” out of sintra and drilled holes for bolts that the armature wire would bend around. To make the fingers, I traced my hand onto a scrap piece of wood and added screws to the tips of the marked fingers. I snaked the wire around all of the bolts and screws until a copy of my hand was made. The wire was secured to the palm with the bolts, and the palm was secured to the connector with some more bolts. I wriggled the mannequin hand into the costume gloves and attached them to the forearms. Depending on your costume, it may be very necessary to add padding or musculature to your PVC skeleton. The armor set needs to be supported by a built-out torso and hip structure. The belt, abdomen plate, and chest cover need to sit against dense padding so that it won’t fall down. I used some spare packing foam cut to size and taped into place to build up this structure. Left-over foam pool noodles were used on the arms to mimic my super-buff biceps. If this were a regular Storm Trooper, the armor covers most of the body. The Shore Trooper has many more fabric elements that seem to hang loose and baggy if not supported. We stuff the shirt and pants with foam pieces and wads of grocery bags to give them additional volume. Lastly, It was time for Dan to get suited up. Because many of the larger pieces were friction fit together, they came apart easily so I could get the clothes on. Piece by piece the whole armor set came together. 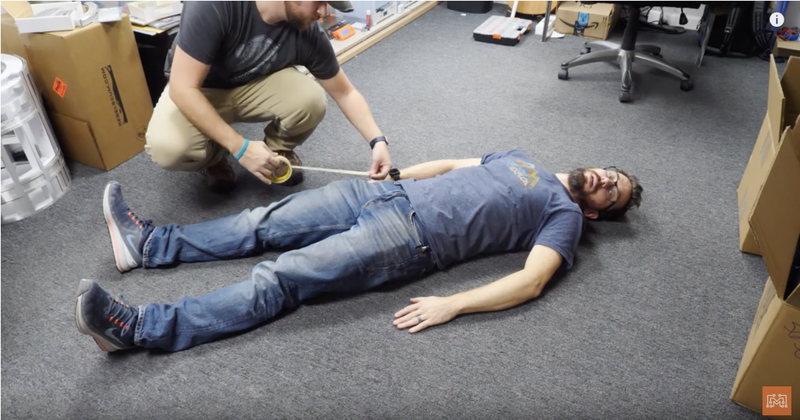 As designed, we were able to loosen and tighten the PVC unions with the cloths on to change Dan’s posture. The the armature hands were able to grip the rifle perfectly and the rigid right arm help the weapon without drooping. I Have a Giant Action Figure! You know in movies when there is a life-size Darth Vader or Iron Man in the background of some super-nerd’s office…I have that now! Of course we still aren’t used to having Dan in the office, so it scares Josh and I every time the lights turn on and there’s a guy pointing a space gun at us. But I am so happy with the armor and the stand, and that we can pose him in different ways. This project was a huge success and I hope you liked it too!